As a way to ensure students get the most out of their educational experience, the House passed legislation this week that would remove the heavy focus on standardized testing as a requirement to graduate and instead allow students various options to show proficiency in pursuing their own career paths. Senate Bill 1095 would provide Pennsylvania students with additional options to fulfill high school graduation requirements beyond the Keystone Exams. Students who do not score proficient on the Keystone Exams would be able to demonstrate their readiness to graduate through alternative routes. Specifically, the bill outlines several commonsense options for assessing student performance while also giving teachers more flexibility with classroom instruction time. Some alternatives include a student’s successful completion of work-based learning programs, a service learning project, or an offer of full-time employment as evidence of post-secondary readiness. This legislation, which now goes back to the Senate, seeks to enhance a multi-bill package to expand career and technical education to benefit both students and employers looking to fill jobs in high-demand fields. 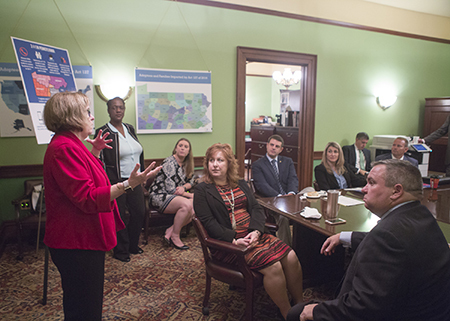 The House Majority Policy Committee, of which I am a member, this week held a roundtable discussion on recent improvements to the PA 2-1-1 human service helpline. 2-1-1 is like 4-1-1 but for health, human services and disaster relief. The 2-1-1 system is free, confidential and available 24-hours a day to connect Pennsylvanians in need with health and human service assistance available through government programs and private and nonprofit organizations in their communities. Last year, the General Assembly approved legislation to create a public-private grant program to assist the United Way in expanding the 2-1-1 service and ensuring efficiency and quality standards across the state. This legislation and state funding have helped increase 2-1-1 coverage to nearly 100 percent of the state population, increased efficiency in the delivery of services and helped Pennsylvanians avoid more costly care, ultimately benefitting taxpayers. Pennsylvanians can dial 2-1-1 to be connected with an operator who has access to a database of health and human services available in their local communities. For more information, visit www.pa211.org. Through a special program administered by the Department of Conservation and Natural Resources (DCNR) and the federal government, grants are available to help rural fire companies guard against the threat of wildfires in the state’s forests. East Cameron Township Fire Co., Shamokin $1,471. Lower Augusta Volunteer Fire Department, Sunbury, $5,000. Stonington Volunteer Fire Co., Sunbury, $10,000. The key objective is to better equip and train volunteers to save lives and protect property in unprotected or inadequately protected rural areas. Grant recipients are selected based on vulnerability and adequacy of existing fire protection. Aid is granted on a cost-share basis, with recipients supplying matching funds. The maximum grant awarded to any fire company in 2018 was $10,000. 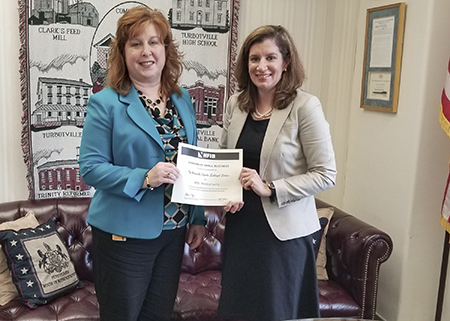 This week, Margaret Parsons, a grassroots manager from the National Federation of Independent Business (NFIB), presented me with the Guardian of Small Business award for my consistent voting record to protect and enhance small businesses across the Commonwealth. NFIB is the state’s leading advocacy organization for small and independent businesses. Act 77 of 2018 increased initial and annual training hours for Humane Society police officers, and requires the training to include the proper procedure to file citations and warrants, including when and how to contact other law enforcement. Other provisions of the new law require training in farm operations and biosecurity, including at least one on-site visit to a working commercial farm operation. Any organization that employs Humane Society police officers will be subject to the state’s Right-to-Know Law. Additionally, a Humane Society police officer must be a resident of Pennsylvania. If the appointment of a Humane Society police officer is revoked in one county, it would be revoked in all counties. Specifically, the bill would increase penalties for those involved in hazing; require schools to have policies and reporting procedures in place to stop hazing; and ensure that parents and students are provided with information related to the issue. The legislation also would establish clear parameters on hazing for organizations such as fraternities and sororities. Locally, the public is invited to attend the 29th Annual Sunbury Fire Department Memorial Service on Sunday, Oct. 14, at 2 p.m. at Cameron Park in Sunbury.